From the earliest ages, children enjoy games, from hide-and-seek and peek-a-boo to simple no-read board games. They especially enjoy games with small pieces they can hold in their hands. 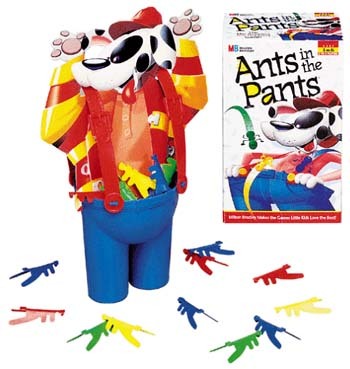 Ants in the Pants combines some of children's favorite play patterns: motion/action and fast play with solid rewards. The 3-D game offers children a brightly colored toy as the game board, a dog that stands vertically so kids don't have to reach so far to play, and small ant pieces in primary colors. To play children choose a colored ant, press down on its back and flip it at the dog. If the piece hits its target, the ant bounces off the dog and into his pants. The first player to get all of his/her ants into the dog's pants wins. This game is for two to four players, but a child can practice alone. This is a toy that really stimulates a child's motor skills and hand-eye coordination. It also forces the child to develop game play strategy and prepares him/her for games that require advanced thinking and controlled coordination. Especially appealing to energetic little critters, the classic toddler game Ants in the Pants requires no reading or waiting for turns. It's One--two--three--Go! and everyone is racing to pop all four of their bugs into Fido's bloomers. It's that simple. Plastic ants are big enough (2.5 inches) that even little fingers find it easy to perform feats of insect trajectory. A hilarious hit with the shorter set.